If your guests have come from miles away to see you off on your journey, these little personalized mini suitcase favors are the perfect choice. They are intricately detailed with tiny rolling wheels and a luggage handle that pulls up and down. On the front side of the suitcase (opposite the wheels and handle), you can easily attach the personalized rectangular stickers that include the bride and groom's name along with the wedding date. 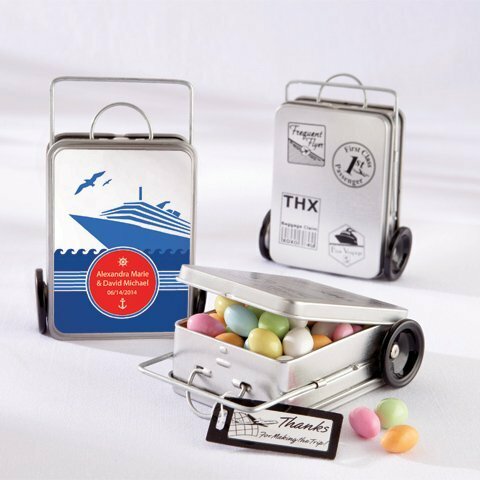 Each suitcase favor tin also has a little hang tag on the handle that says "Thanks For Making The Trip". 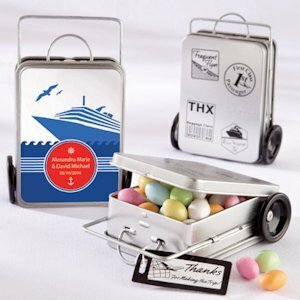 Fill these tins with your choice of candy, nuts, mints or little trinkets (not included). Each tin measures 3 1/4" by 2 1/2" by 1 1/4". Tins are sold in sets of 12.